At Capability Homecare we take falling very seriously. In fact, it is a common problem among seniors. So much so that this week has been declared National Fall Prevention week. 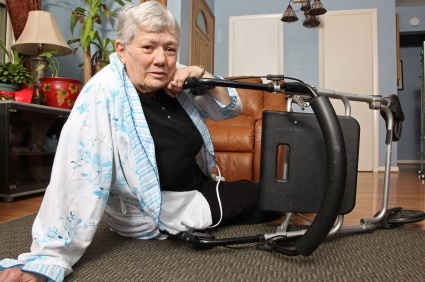 It is estimated that 5.8 million older adults have fallen in the last 3 months. Falls are the leading cause of injury death among adults 65 and older. According to the Mayo clinic, there are 6 simple things that everyone should do to help reduce the risk of falls in your home. Talk to your doctor about medications. Some medications- anti-depressants and sedatives can increase your risks. If you are suffering from any joint pain, dizziness or shortness of breath you could be a fall risk. Is your home safe? Take a look around your house- are there items that you could trip over easily? Throw rugs, coffee tables, electric cords- all pose safety risks. Lighting? Is your home well lit? Do you have nightlights? Are walkways/ hallways well lit? Is a flashlight next to the bed in case of power outage? Is there something to grab? For a small fee you can hire someone to come in and make small changes- add grab bars, hand held shower attachments, hand rails on both sides of stairs and non slip treads on stairs. Does the shoe fit? This may seem simple- but are your shoes dangerous? ‘High heels, floppy slippers and shoes with thick soles can make you slip, stumble and fall’ (Mayo Clinic). Do you get enough exercise? Exercise can improve balance, coordination and stability. Look for a class that is low impact and geared towards seniors. Capability Homecare caregivers are specifically trained to help keep seniors safe in their homes. For more information, please call us today. 425 679 5770.